The 2010 appointment of Elena Kagan to the United States Supreme Court meant that, for the first time, three female justices would serve together on that court. Less clear is whether Justice Kagan’s gender will really matter in how she votes as a justice. This question is an especially visible aspect of a larger issue: do female judges display gendered voting patterns in the cases that come before them? This article makes a novel contribution to the growing literature on female voting patterns. We investigated whether female justices on the United States Supreme Court voted differently than, or otherwise influenced, male justices on securities law issues decided by that court over the four decades spanning the years 1971-2010. To our knowledge, no prior empirical study has examined gender and judging in the securities area on any court, and only one study has assessed that topic in the related field of corporate law. Working with an admittedly small set of cases, our study’s findings revealed no discernible gender impact on the outcome of securities cases in the Supreme Court. Neither female Justices on an individual basis, nor panels including female Justices, showed any significant difference in the resolution of securities law issues. Nevertheless, our data do suggest several interesting and meaningful trends in securities cases involving female Justices. For example, a comparison between all-male panels and female-included panels showed that a female-included panel was marginally more likely to leave open the possibility of sanctions for securities violations, as opposed to declining to impose sanctions altogether, which an all-male panel most often held. Moreover, all-male panels were more likely than female-included panels to demonstrate a pro-corporate bias, measured by whether the Court held for the corporate party and whether that corporate party was the defendant in the lower court action. In addition, our data revealed that unanimous verdicts were reached more often with female-included panels. These are some of the findings we report, which also serve as a baseline for further study as to whether the presence of a third female justice will alter voting patterns. Lyman P.Q. 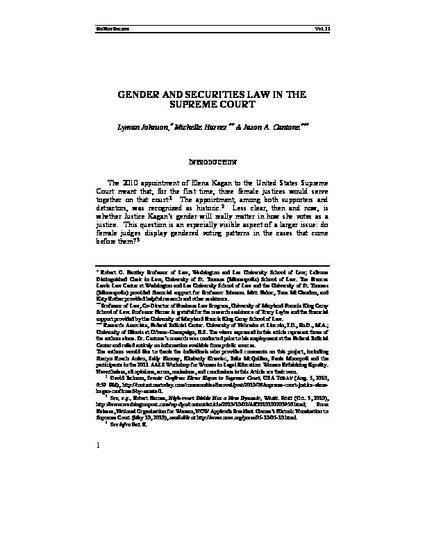 Johnson, Michelle Harner & Jason A. Cantone, Gender and Securities Law in the Supreme Court, 33 Women's Rights L. Reptr. (2012).